The following press release on the attack on Rasmea Odeh in Germany was originally issued in German and distributed to the media. View the German language original at this link. Rasmea Odeh is a Palestinian women’s rights activist who was sentenced in 1969 by an Israeli military tribunal after being convicted of participating in an attack. Her confession was extracted under torture and sexual violence. Her confession was revoked in court, as well as before the UN Special Committee to Investigate Israeli Practices Affecting the Human Rights of the Population of the Occupied Territories. In 1979, she was released as part of a prisoner exchange. Odeh co-founded the Arab Women’s Committee in Chicago. She was awarded the Outstanding Community Leader Award by the Chicago Cultural Alliance for her work on political education in 2013. Dareen Tatour is a Palestinian poet with Israeli citizenship, who spent years in house arrest and was sentenced to a five-month jail term after initially being arrested in October 2015 for publishing her poem “Resist, My People, Resist Them.” She was put on trial in an Israeli court for incitement and support of terrorism. PEN America and many freedom of expression organizations internationally demanded the poet’s immediate release. On the afternoon of 15.03.2019, the Berlin Senate Department for Internal Affairs and Sport prohibited Rasmea Odeh from taking part in the cultural event. The immigration office claimed that Rasmea Odeh, by her mere presence in Berlin, posed a danger to security and revoked her Schengen visa. Israeli Minister of Strategic Affairs Gilad Erdan has claimed that this ban was implemented through the intervention of his ministry and the Israeli ambassador as well as a number of Jewish organizations. Here again, an attempt has been made by the official Israeli state to influence and impede cultural events in Germany. A few days before the scheduled event, Rasmea Odeh was branded unchecked in several sensationalist articles as a “terrorist”, “hate preacher” and “anti-Semite”. It should be noted that to date no journalist has sought direct contact with Rasmea Odeh for comment or interview. It should also be noted that most of the articles in the local press (Tagesspiegel, Berliner Zeitung, Berliner Morgenpost) do not mention the fact that Odeh’s confession was made under torture and sexual violence. The articles found rapid and unchecked widespread distribution. Even politicians such as the Berlin Interior Senator accused Odeh of “anti-Semitic propaganda”, and the US ambassador even used the terms “murder” and “terrorism”. So far, there was only one article in taz, which indicates that freedom of expression is endangered by the ban on the event. On 18.03.2019, an urgent hearing was requested at the Berlin Administrative Court. The aim is to prevent the deportation of Rasmea Odeh. We are calling for a withdrawal of the baseless allegations against Rasmea Odeh made by the Berlin Senate, the Mayor of Berlin, Michael Müller, and the Senator for the Interior, Andreas Geisel. We are also calling for objective and fair reporting. We would like to receive a contact from the Senate on this matter, as well as a commitment to constitutional and international law protecting freedom of expression. 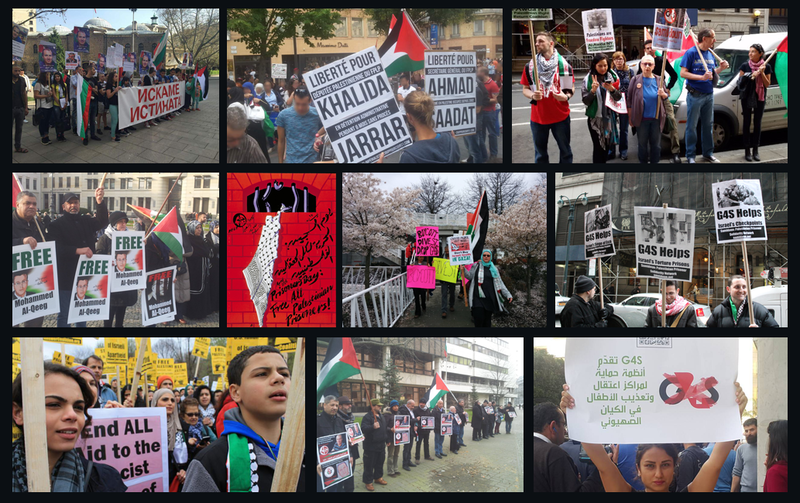 In light of what has taken place, we cannot help but to recognize the intimidation and criminalization of Palestinian and migrant voices and narratives in the approach to the planned event. Samidoun and Rasmea Odeh’s lawyer are available for clarification and comment at any time. “Miss Rasmiah ODEH (A/AC.145/RT.262 and 264) was arrested on the night of 28 February 1969 with her father and two sisters. Their house was blown up several days later. After being interrogated for 45 days (including 25 days of non-stop interrogation night and day) at the Russian Compound, in Jerusalem and at Ramle prison, she was sentenced, on 22 January 1970, to life imprisonment on charges (which she denied) of planting explosives in a supermarket…. Miss Odeh gave a detailed description of the physical ill-treatment to which she was subjected during her interrogation. She also described the psychological torture that she had experienced when her father, sisters, fiancé and other comrades were ill-treated in front of her or nearby. She stated that the physical torture to which she had been subjected included being stripped naked, chained and beaten with sticks and metal bars, on her head as well as on her body thereby causing her hearing problems for over one year.